In my last podcast, I told you about Melbourne’s train system. That’s the best way to get to and from the suburbs of Melbourne. But when you are in the city centre, the electric Tram system is the best and most enjoyable way to get around. Melbourne’s trams add colour and are a part of the character of Melbourne. I love to hear the sound of a tram bell as a tram approaches a tram stop. I can still remember taking my two boys on their first tram ride when we came to live in Melbourne in 1994. They were so excited as young children to be riding on a tram through the streets of Melbourne. And so was I. I still enjoy a tram ride today, around 20 years later. 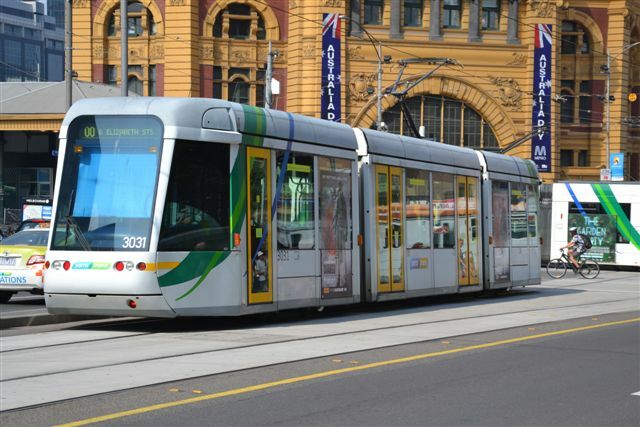 Melbourne’s tram system provides transport for the city centre and many suburbs close to the city. Actually, Melbourne’s tram system is the largest city tram network in the world. The network has 250 km of track, 487 trams, 30 different routes and 1,767 tram stops. Like the trains, trams are quite cheap to use and are great for students, shoppers, tourists, city workers and those who live in or near the city centre. Melbourne’s trams also take very large numbers of people to and from the many sports and other special events here in Melbourne. For example, during the Australian Rules Football season and the cricket season, extra trams will run to carry many sports fans to and from the MCG and the Docklands Stadium. During events such as the Australian Tennis Open in January, the Australian Formula One race in March and the Melbourne Cup in November, extra trams will also be running in order to move the large numbers of people to and from the venues. And it works very well too. Trams are great people movers. One of the great things about trams is their colour. Many trams are painted in bright colours or covered with bright advertising. My favourite tram is the one painted with pictures of Rhinos. Rhinos are a very heavy African animal. Trams are big and heavy too. This tram is giving the message that one tram weighs as much as 30 Rhinos. Car drivers need to take care that they don’t collide with a tram. Trams are not to be argued with on the road! A popular tram in Melbourne is the City Circle tram. This is free and operates just within the city centre. It goes in a circular route around the city centre passing major tourist attractions and shops. You can hop on and hop off these trams during the day as you explore the city. City Circle Trams run in both directions around the route and come every twelve minutes or so, between 10am and 6pm from Sunday to Wednesday and from 10am to 9pm from Thursday to Saturday. These trams are heritage W class and are painted maroon. You should try these when in Melbourne. Riding a tram is easy. You will need to buy a Myki card (just $6 at retail stores and railway stations) and ‘touch on’ when you get on the tram, then ‘touch off’ as you get off. It’s that easy. Have fun on Melbourne’s trams. Podcast 7 Quiz - Did you understand the podcast? True or False? – The best way to get around the city centre is on Melbourne’s train system. True or False? – Melbourne’s tram system is the largest city tram network in the world. True or False? – During major sporting events, there will be extra trams running to move sports fans from and to the sports venues. True or False? – Melbourne’s trams are painted in dark colours. True or False? 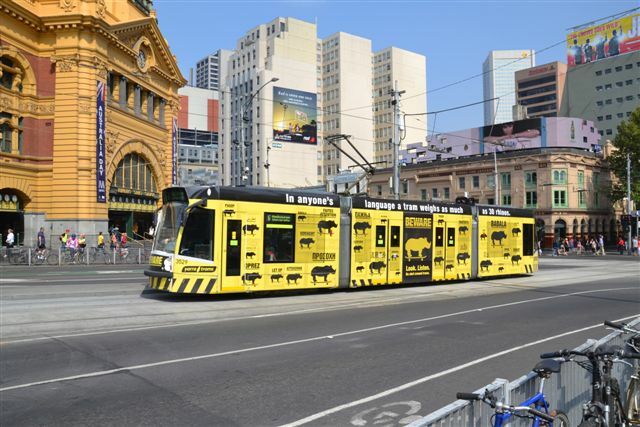 – The tram painted with pictures of rhinos is advertising Melbourne’s zoo. True or False? – The city circle trams are great for exploring the city centre of Melbourne. True or False? – When you travel on a Melbourne tram you will need to pay with cash. True or False? – City circle trams come every 12 minutes or so and travel in only one direction. True or False? – A tram weighs as much as 30 rhinos and car drivers should be careful when driving near trams. True or False? – Rob thinks that trams are a part of the character of Melbourne. colour = red is a colour. Other colours are blue, green and yellow. The sky is blue. retail stores = places where you can buy things. Also called a shop. It’s been a week since listening to your podcasts. I’ve only visited Sydney but your podcast really makes me want to visit Melbourne one day as well. In Sydney, I had to use the ‘opal card’ for any transportations but here it’s Myki ! Interesting. I thought adding ‘the’ before major sounds natural as well. The presence of ‘the’ is not important here? I really don’t get when it’s allowed to omit articles. The contents are really enjoyable, cheers. Many thanks for your comment and your kind words. That is a great question you have asked about the article. The sentence you refer to is – ‘It goes in a circular route around the city centre passing major tourist attractions and shops.‘ You have asked if there could be a ‘the‘ before the word ‘major‘. If I had put that word in at that spot, then it would imply that the tram passes ALL the major tourist attractions and shops of Melbourne. In fact, the tram passes some, but not all. By leaving the word ‘the‘ out of the sentence, I am inferring that there are some tourist attractions and shops which the tram doesn’t pass by. I hope that explanation is useful. That was a great question and shows that you are really understanding English very well. Nice work! Many thanks for your quick and detailed explanation, Rob. So what you mean is that the sentence without ‘the’ implies the tram may not pass by some attractions. Actually, what I expected at first was it passes ALL stations as leaving ‘the’ out of the sentence because for me, No article sounds signifying something general. And I also expected you could point some specific attractions where the tram doesn’t pass by as putting ‘the’. But it was totally opposite! It’s fun getting to know this kind of delicate thing. Thank you so much again. I’ve found tour site fortunally. I’m learnig a lot of English language and Australia too. Many thanks for your message. I’m pleased that you find my website useful. Your English seems very good, so well done. Learning a language is not easy. What a pity that is not to see youngers on the pictures which are providing to get any idea about people who live in Melbourne. I think there are very large numbers of older people in population of Melbourne. It’s just a guess. I can make a mistake while I comment or say something about pictures. That is fascinating topic to learn daily life in Melbourne and get idea without go over there. Its mean not clear which is “to and from” that have used 4 times in different sentences by yourself. Is its mean same (single) or changing depends on to explain any case (sitiation). Thanks for everything. Peace out. Thanks for your comment. We have lots of young people in Melbourne, like any big city. Our population is growing so you will find lots of children, teenagers and young adults in Melbourne. I took my pictures in the centre of Melbourne on a normal working day, so you would expect there to be fewer younger people in the city on that day. The term ‘to and from’ means that the trams carry people to their destination, and also back again. For example, they may catch a tram to the Victoria Markets, then they catch a tram back home again (from). I hope that explanation helps.